The AAV-3G-XMUX is an analog and digital audio embedder/ de-embedder for 3G/HD/SD-SDI signals. Various configurations of analog inputs and outputs can be achieved by selecting various analog audio piggy back modules. The digital audio ports are bi-directional and can be configured individually. 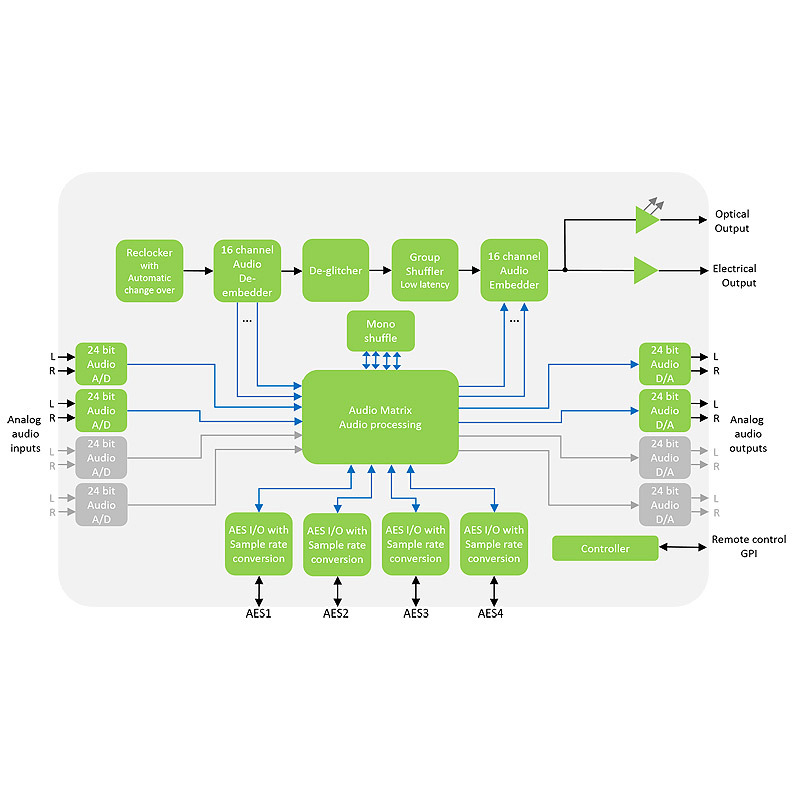 The AAV-3G-XMUX comes with an extensive audio processing covering a full audio matrix for audio routing, individual channel gain control, channel manipulation and transparent transport of non-audio data like Dolby-E. The card is easy to use with minimum setup needed and broadcast centric control enabled thru Nevions control panel support. 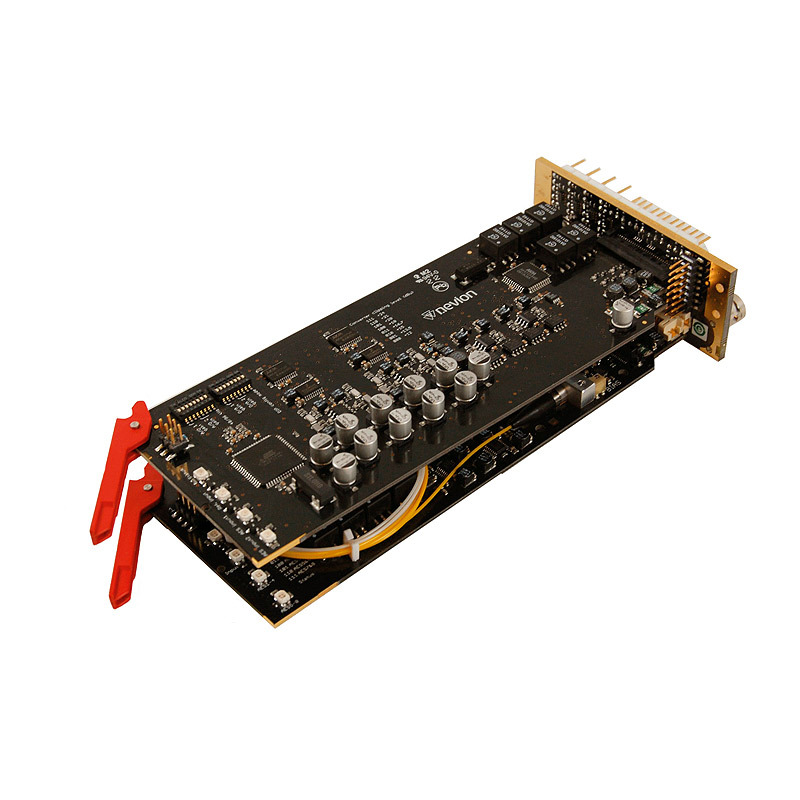 22924 AAV-3G-XMUX-Cx 3G/HD/SD-SDI Embedder/De-embedder with 8ch Analog Audio and 4ch AES. The product is available with analog audio configurations of 4 in +4 out, 8 in or 8 out thru different piggyback modules. Sample rate converter on AES inputs. Built-in audio matrix and processor, variable audio delay. RS-422 emb./de-emb. GYDA enabled and SNMP support. 22930 AAV-3G-XMUX-Cx-13T, -5dBm 3G/HD/SD-SDI Embedder/De-embedder with 8ch Analog Audio and 4ch AES and optical 13T, -5dBm transmitter. The product is available with analog audio configurations of 4 in +4 out, 8 in or 8 out thru different piggyback modules. Sample rate converter on AES inputs. Built-in audio matrix and processor, variable audio delay. RS-422 emb./de-emb. GYDA enabled and SNMP support. 22926 AAV-3G-XMUX-Cx-C1xxx 3G/HD/SD-SDI Embedder/De-embedder with 8ch Analog Audio and 4ch AES and optical CWDM, 0dBm transmitter. The product is available with analog audio configurations of 4 in +4 out, 8 in or 8 out thru different piggyback modules. Sample rate converter on AES inputs. Built-in audio matrix and processor, variable audio delay. RS-422 emb./de-emb. GYDA enabled and SNMP support. 22925 AAV-3G-XMUX-Cx-R 3G/HD/SD-SDI Embedder/De-embedder with 8ch Analog Audio and 4ch AES and optical short haul receiver. The product is available with analog audio configurations of 4 in +4 out, 8 in or 8 out thru different piggyback modules. Sample rate converter on AES inputs. Built-in audio matrix and processor, variable audio delay. RS-422 emb./de-emb. GYDA enabled and SNMP support. 22928 AAV-3G-XMUX-Cx-R-13T, -5dBm 3G/HD/SD-SDI Embedder/De-embedder with 8ch Analog Audio and 4ch AES, optical short haul receiver and 13T, -5dBm transmitter. The product is available with analog audio configurations of 4 in +4 out, 8 in or 8 out thru different piggyback modules. Sample rate converter on AES inputs. Built-in audio matrix and processor, variable audio delay. RS-422 emb./de-emb. GYDA enabled and SNMP support. 22927 AAV-3G-XMUX-Cx-R-L 3G/HD/SD-SDI Embedder/De-embedder with 8ch Analog Audio and 4ch AES and long haul optical short haul receiver. The product is available with analog audio configurations of 4 in +4 out, 8 in or 8 out thru different piggyback modules. Sample rate converter on AES inputs. Built-in audio matrix and processor, variable audio delay. RS-422 emb./de-emb. GYDA enabled and SNMP support. 22929 AAV-3G-XMUX-Cx-R-L-C1xxx 3G/HD/SD-SDI Embedder/De-embedder with 8ch Analog Audio and 4ch AES, optical short haul receiver and CWDM, 0dBm transmitter. The product is available with analog audio configurations of 4 in +4 out, 8 in or 8 out thru different piggyback modules. Sample rate converter on AES inputs. Built-in audio matrix and processor, variable audio delay. RS-422 emb./de-emb. GYDA enabled and SNMP support. I want to know more about AAV-3G-XMUX 3G-SDI analog and digital audio embedder/ de-embedder.